Saturday morning in London, threatening lead-coloured sky, and the area outside the Parliament is still oblivious to the stream of visitors who is yet to turn up – certainly to be let down by a Big Ben scaffolded to the teeth. But who cares about the outside world on a fine day like today? Surely not my colleagues and I, who are about to step into a space well stocked with coffee, pastries, friendly faces, and of course, linguistic food for thought. If you missed Members’ Day and would like to know how much fun we had, let me guide you through it. If you were there, please help me complete this account – by no means comprehensive – via your comments. It’s well past 9 o’clock and, after some catching up, the curtain goes up and the Chartered Institute of Linguists’ AGM starts. After the usual housekeeping (as a Spaniard, the British obsession with fire never fails to amaze me), we get down to serious business: voting for the new President – Richard Hardie – and honouring the former, Dr Nicholas Bowen, sadly departed last year; announcing the new council members elect – congratulations to all! 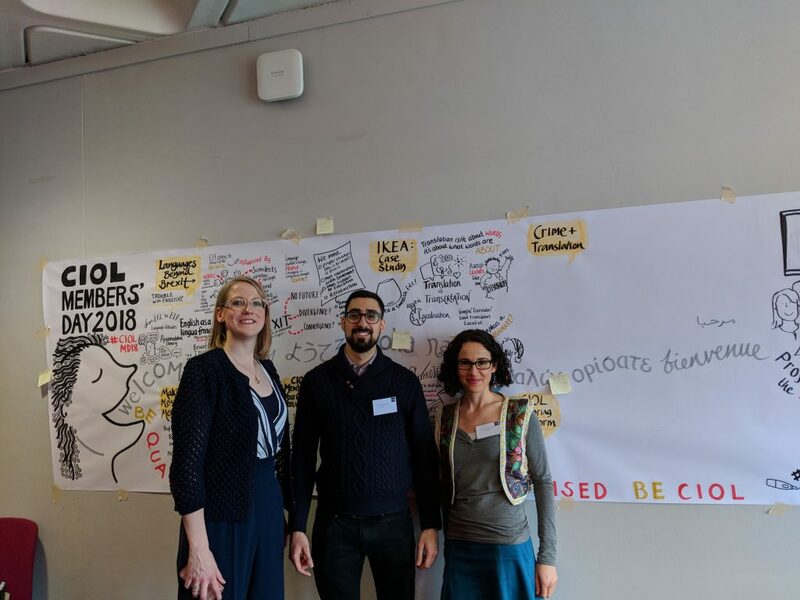 ; discussing the state of the accounts, which sounds pretty healthy; and reviewing the proposed amendments to the CIOL’s rules, intended to simplify processes and terminology. After some back and forth discussion regarding the last two issues, it’s time to welcome the rest of the attendees, have some more coffee, and listen to CIOL’s CEO Ann Carlisle open the day requesting a show of hands from new members. Good news! The room abounds with new colleagues, who together with the rest of us makes for the largest audience ever seen on Members’ Day. 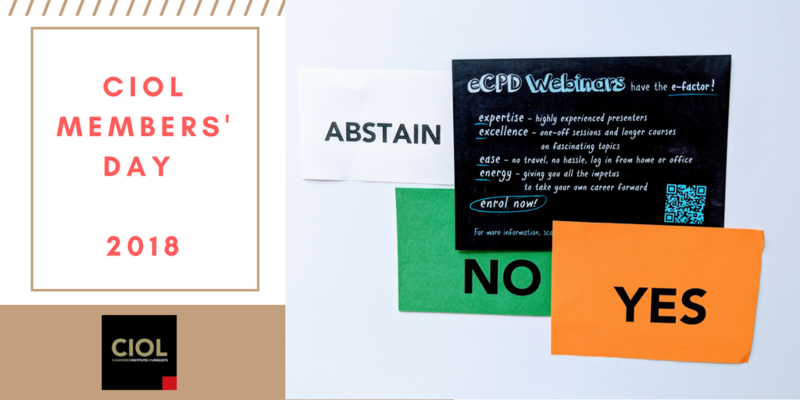 After a quick demonstration by the membership team of how to benefit from new and old features on the website, it’s time to split up into smaller groups and flip the CPD switch to ON! 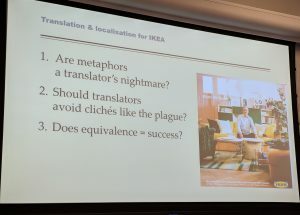 The first seminar I attend is Translation and Localisation for IKEA, by Ian Hinchliffe, who’s been translating for the company for 35 years. Small audience, but very engaged and certainly avid to unveil the secrets of the Swedish giant. Just to clear the air, Ian begins by lifting the first veil: ‘Translating for IKEA is like doing it for any other company.’ Having deconstructed the myth, it’s time to surprise us with the fact that there is no official glossary or consistent in-house translation process; each store takes care of their own linguistic needs. What comes as no surprise is that IKEA’s deadlines for translators are as tight as everywhere else, regardless of how creatively demanding a job is. The ‘IKEA attitude’, which Ian basically describes as ‘we are Swedish, and that’s what we sell’, translates into little localisation effort. IKEA lives and thrives in its swedishness. Linguistically, this results in the occasional funny name for a piece of furniture (eg Jerker desk or Båstad sofa). Another issue which was raised is how creative a translator can be while still producing a text that stays relevant and meaningful to the target audience’s mindset. Should we sacrifice wordplay for the sake of linguistic clarity? Playing with words might cause the attention to be focused on language when the company wants it on the product. Our challenge as linguists lies in finding the desirable happy medium. And if possible, in one or two days! Now, how is that for a challenge? After a 15-minute coffee break, it is time for the second seminar, which in my case is Konstantin Kisin’s Clients Relationships and Communications for Freelancers. After cracking a few jokes to help boost the effects of the caffeine we had just consumed, he introduces the question that will keep us busy for the next hour or so: What game do you play with your clients? Don’t panic! It’s a multiple choice question: (a) losing by losing; (b) winning by losing; (c) losing by winning; or (d) winning by winning. If the choice isn’t very helpful, just bear with me. The idea is to establish and cultivate constructive relationships with our customers. And we do that by paying attention to four key elements: equality, respect, flexibility, and mutual benefit. Self-confidence is the key that will unlock the door to a relationship in which your client will perceive you as an equal, a valuable member of the team. You’re an indispensable asset to their success, and how you see and sell yourself is part of how you prove it. However, respect and equality don’t come without a fair share of flexibility on our part; we need to spot the times when giving way is in order: perhaps a weekend assignment, a lower rate, waving a rush surcharge or a minimum fee… As an exception, and that’s the key. If you’re doing your client a favour, make sure they know. This means they owe you. As freelancers, sometimes we forget we are entitled to say no, to negotiate, to tell a customer we’re busy and we will call back later (perhaps just a strategy so we can think out what we want to say), but there is one thing we are not entitled to, do you want to guess? Yes, we can’t miss a deadline. That kills equality, respect, flexibility, and mutual benefits in just one blow. Also, to nourish successful client relationships we need to praise them when they deserve it, and let them know when they’re wrong. They’ll respect us for both. And most importantly, we can never forget – never – that the voice on the other side of the line, or the hand typing those emails is attached to a person. We are human, and so are clients. Who would have thought?! And speaking of nourishment, no linguist can think on empty CPD batteries, so let’s go recharge! I let the pleasant smell of warm food guide me along labyrinthine corridors and deserted seminar rooms into a lively space where most have already found a spot around a table. I help myself to some yumminess and join some colleagues to share fuel and impressions. Lunch is also the perfect opportunity to catch up with the membership team and pick up our CPD certificates. This is also a good moment for me to stop, take a step back, and observe. I take in the atmosphere, listen to the animated humming stemming from the tables, and welcome the feeling of belonging to a privileged bunch. The sessions after lunch gather all of us in St James Room to learn about the Institute’s year ahead. 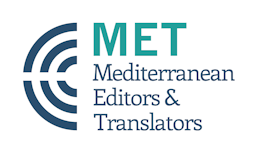 Some exciting news are the recent acquisition of eCPD Webinars and a new platform for the journal The Linguist. To finish, Prof Joanna Drugan, from the University of East Anglia, is in charge of the Threlford Lecture: Crime and Translation. As it turns out, crime is a polyglot and this constitutes a challenge for the police, who have to collaborate with translators and interpreters to investigate transnational issues, often as serious as human trafficking. She shares some of the findings of the research being conducted in the UK, research which will cross the Channel into Belgium soon: international wrongdoing calls for an international project. Among other shocking details, she makes us cringe at the thought of working in the conditions that some colleagues are being exposed to. ‘Be ready tomorrow and available for 48 hours, bring no phone and no laptop, tell people you won’t be reachable, and by the way, the place and the very mission are a secret until you get there.’ How can anyone prepare for that? Not only linguistically, but also psychologically! The linguistic pitfalls are also considerable, with the source language often being dialect, slang, or even a secret code. To me, it sounds more like a job for an undaunted Harry Potter than for a linguist! I think we all sympathise with these anonymous colleagues. Sad as it is for these crime networks to thrive all over the place, this talk confirms one more time that language plays a key role in most contexts. Although this is sort of preaching to the choir – we linguists know that already – it is a good reminder of how valuable our skills are. It’s crucial that we not forget, for it seems that we must remind others constantly, from our clients to politicians who wipe out foreign languages from school curricula. After a well-deserved ovation, the curtain dropped, and slowly but surely we started to trickle into Westminster Room for the final drinks reception. The last chance to catch up, meet someone new, get some advice from the event’s sponsors, pose for a group picture, and at the stroke of five, we say our goodbyes, red tote bags in hand, and start retracing the route that led us to this celebration of languages quite early in the morning – for a Saturday, anyway. But, wait! While all of the above is happening, a quiet, talented hand is hard at work in St James Room capturing every word, opinion, and idea being spoken, voiced, and shared. Caroline, from Chapple Cartoons, delights us with a visual account of Members’ Day that I won’t even try to describe. Because a ‘scroll’ is worth a thousand words, here is a picture of it. And if it really is true that an image is worth a thousand words, perhaps this post makes no sense and this image would have sufficed, but since I have come this far, I might as well let it be, right? 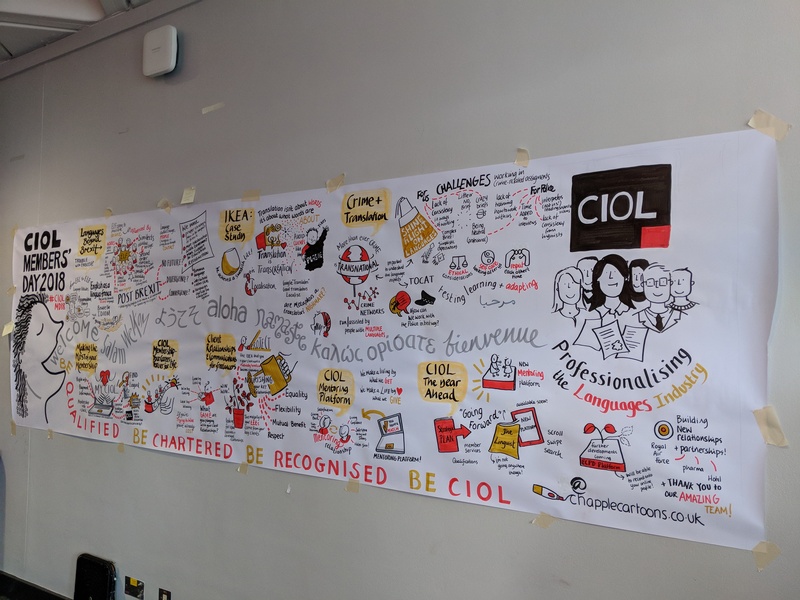 So, were you at CIOL Members’ Day? Which seminars did you attend? What did you learn? If you missed it, share your thoughts anyway!